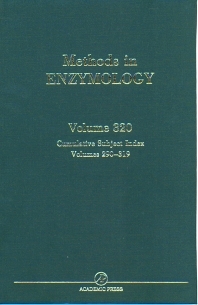 General Description of the Volume: This is the Cumulative Subject Index for Methods in Enzymology Volumes 290-319. It will supplement the Methods in Enzymology Index Volumes 75, 95, 120, 140, 175, 199,299, 265, and 285. In addition to the Subject Index, this volume includes the complete Contents of each volume indexed, and a Contributor's Index. Life science researchers, graduate students, and information professionals in academic and special libraries.